The new 2015 employment laws white paper is here! CalChamber’s employment law counsel analyzed the significant pieces of legislation that Governor Brown signed into law and prepared a white paper summarizing their effects on California employers. 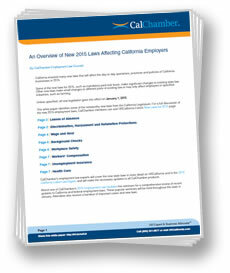 An Overview of New 2015 Laws Affecting California Employers is now available for download. CalChamber members can access a full discussion of the new laws on HRCalifornia.